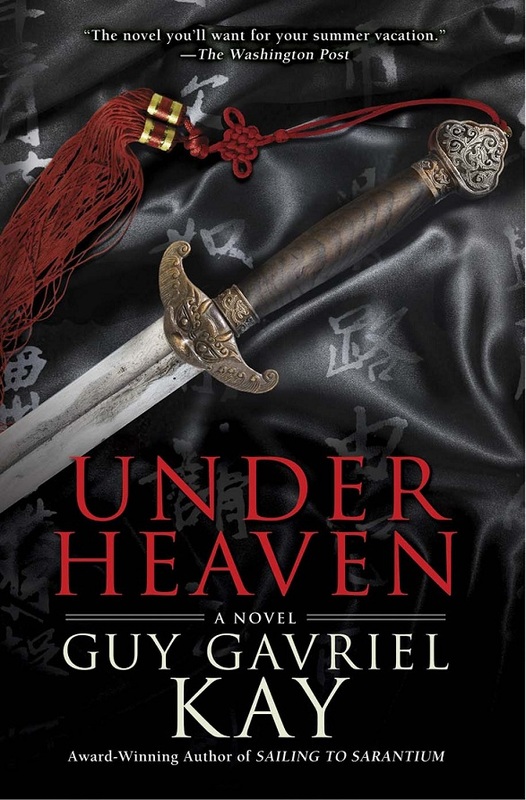 Under Heaven begins with haunting desolation, visits with imperial opulence, and then finds a sort of balance between them. A fitting journey, as the philosophies of the culture of Kitai focuses on balance in life, balance in all things. In the western wildernesses of a fictional Tang Dynasty China known as Kitai, Shen Tai honors his late father by spending the requisite mourning period at the battleground, burying the dead of both sides, treating all he comes across with dignity and respect. A Kitai Princess gives Tai a large gift of precious horses for his work at the battleground. Understand, that horses are rare in Kitai, and that a man who owns two hundred and fifty of them could easily be seen as wealthier than the Emperor. Tai’s first challenge is to get home alive. His next challenge is to survive the intrigue and subtleties of the court, where a man can be exiled, or worse, for saying the wrong thing to the wrong person, or having their poetry misinterpreted. Their courtly traditions may seem formal and cold to Western eyes, but it’s these traditions that have kept Kitai powerful and strong through the generations that shaped it. The real story begins when the romance ends. Once upon a time, a man loved a woman, and she dearly loved him back. They met for a secret tryst to make a child. Of course, her husband found out about her affair with her lover, and when the child was born, her angry husband tore the child from her arms. A few hours later, she was dead. Neither her lover nor her husband ever recovered. Twenty three years later, our story, and the song for Arbonne, can begin. Blaise has recently come to the southern country of Arbonne. Worse than being an ignorant northerner and a savage mercenary, Blaise hasn’t a clue about or an appreciation of music and poetry, the foundation of society in Arbonne. In Guy Gavriel Kay’s fictional France, Arbonne is country where troubadours and poets are valued beyond gold, where a young duchess rules a Court of Love, and where political marriages are solved with very, very discreet evening visitors. In the country of Arbonne, music, love and the appreciation of beauty are everything. Coming from a male dominated society where a man’s prowess is proved on the battlefield, Blaise spends his first few months in Arbonne recovering from culture shock. Hired by a famous troubadour, Bertran de Talair, Blaise is soon caught up in webs upon webs of intrigue, fights started a generation ago, and a ruling family carrying a heavy burden. Even worse, it’s not long before Blaise’s identity is exposed: he’s the youngest son of a ruling priest of the war hungry northern country of Gorhaut. In the year that he spends in Arbonne, Blaise will have to learn that this a land of subtlety and intrigue, and what one says is just as important as what one stays silent on, and how one chooses to stay silent. He could be the best thing to happen to Arbonne, or he could destroy the country from the inside. Blaise’s story is only one facet of the complex story, and the more I tell you of the plot, the less of it you will experience through your own eyes, and that would be a crime. Bookthoughts, a funny, and a photo. No review for you this evening, but hopefully my post will still be entertaining. 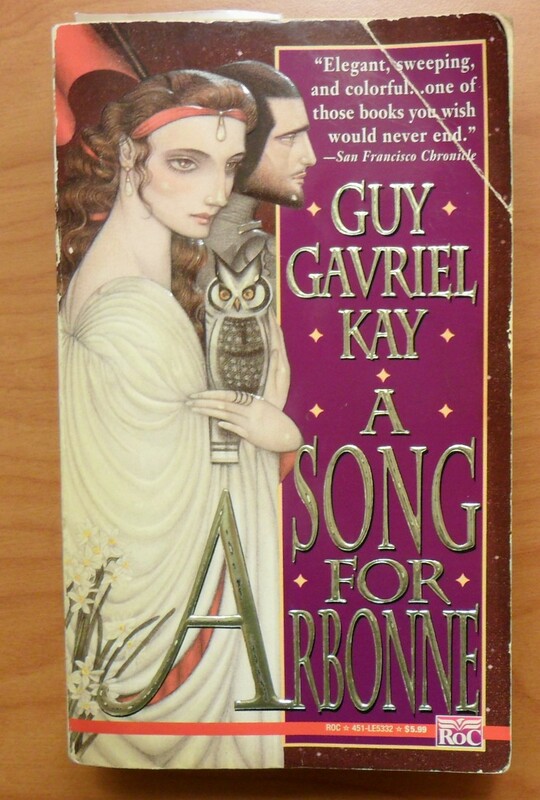 I’m about half way through Guy Gavriel Kay’s A Song for Arbonne (working my way up to Under Heaven). It’s been about ten years since I read this, and it’s just a beautiful as I remember. It’s a long, rather dense book, but oh is it amazing. If you’ve never read Kay, I highly suggest starting for A Song for Arbonne, or The Lions of Al-Rassan. There’s a tiny little scene, about half way through, in a tavern, during a country fair, where some foreign traders challenge the local musicians for a song. It’s a fairly tense scene, and everyone knows that war is on the horizon. I’ll go into it in further detail when I write the review, but understand that in the country of Arbonne, music is everything. And most of their music is of the romantic / love song variety. So this elder musician gets up, apologizes in advance that he isn’t going to play a love song, and plays an older piece, about a famous musician of Arbonne who had traveled north and was missing his homeland. After finishing the song, the musician then states that he did in fact, play a love song. Raise your hand if you’ve ever seen the movie The Sound of Music. Yes, that old Julie Andrews movie. You know that scene, near the end, at the music festival, where Captain Von Trapp plays Edelweiss*? When I was a preteen, I fell head over in heels in love with Christopher Plummer** thanks to that scene. When I got a little older, and understood what that scene was actually about, I cried right along with him. It’s that kind of love song that the elder musician is playing in the scene I described above. And he is singing it in a similarly tense political environment as well. Speaking of love stories, I happened to be reading A Song for Arbonne while at dinner at restaurant. The waitress says “what are you reading?” and not wanting to get into it (because I’d just read the above mentioned scene and was feeling a little raw) I simply said “oh, something old”. She said she’d recently had a birthday and had received the 50 Shades of Grey trilogy, and even though she didn’t usually read romances, she was really enjoying it. The woman at the next booth saved me having to respond by turning right around and gushing that she too was reading 50 Shades, and wasn’t it, like, the best thing, ever? And, since she had just started dating a new fellow, she had asked him if he’d want to try some of the things in the book! The fellow she was sharing a table with visibly blushed, so I’m assuming he’s the guy she asked to tie her up and whip her. *** Dessert, anyone? Why I read it: I’ve read some other Kay titles, and really liked them, and this is part of my “read what I’ve got” new years resolution/challenge. Fifteen year old Ned Marriner is stuck in France with his famous photographer father, who is shooting scenic photographs for a new coffee table book. Living in a villa, beautiful scenery, great food, pretty girls, maybe skipping 2 months of 10th grade isn’t that bad. Sure, his dad’s assistants Melanie, Steve, and Greg, keep a close eye on him, but they also let him have wine. Trying to stay out of trouble during a photo shoot, Ned wanders into an empty church, where he sees the carving, meets the girl, and meets the man. And suddenly, Ned can count what’s left of his childhood in hours. The girl, is Kate, an American exchange student. Nerdy, sassy, and thrilled to find someone who speaks English, Kate takes an immediate liking to Ned. The man, doesn’t know what his name is, yet. On the night of Betlane, when times and worlds are able to intermingle, Ned, Kate, and Melanie get involved in a story that has never been written down, but has been told forever. A story about a woman who had to choose between two men, and how it did, and can, and still could tear everything apart. 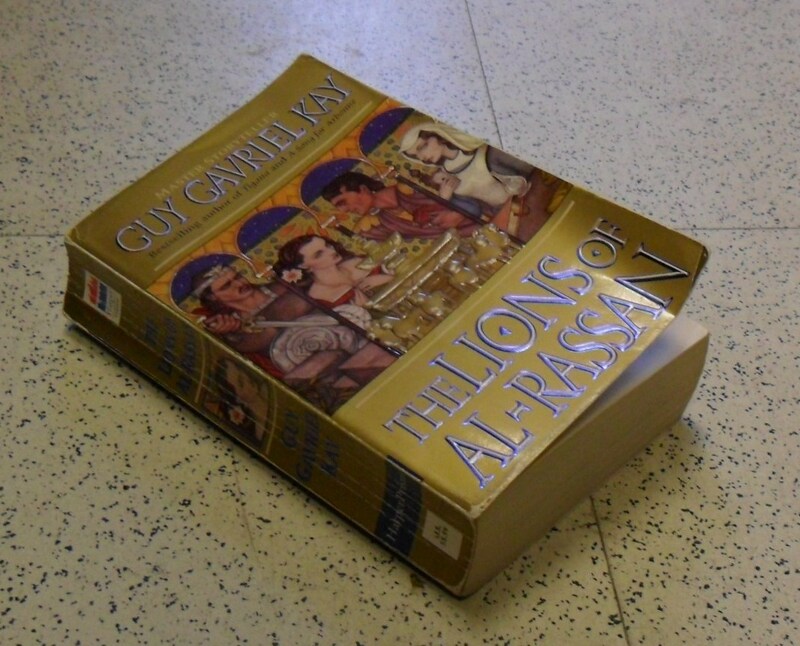 Published in 1996, The Lions of Al-Rassan is not a new book, but it is easily the most moving book I have read this year. If the end of this book doesn’t bring you to tears or compel you to find your loved ones and hold them close, there may be something very wrong with you. That’s a fuzzy photo of my copy. See the bent cover? The stressed spine? I felt it was important to show the how loved this little book has been in my household. The Peninsula of Al-Rassan isn’t that unusual. In every square, tavern and temple the poets, singers, and clerics tell anyone who will listen of the romance of the battlefield. Of how the gods smile on warriors, of the honor, glory, and spoils of war. But the two most famous warriors of Al-Rassan know better. They know that war provides none of these things. All war does is take.